Abel Tasman a sailor, discovered the land mass that is now known as New Zealand in 1642, and John Cook officially mapped it in the 1700s. Modern New Zealand is a very popular tourist destination and gap year hot spot - and it's full extraordinary things to do and experience. The size of England with under 3 million people, means there is room to breathe and enjoy the great outdoors in peace and quiet! Here are a few of the key destinations that people rate as must-see places. This is New Zealand's capital city, and it is home to the National Museum. For those who enjoy off-the-beaten-path adventures, travel an hour north of Wellington to the newly constructed Aotearoa Stonehenge, which is New Zealand's version of Salisbury Plains Stonehenge. New Zealand's stone formations maps the stars - so its a great place for anyone interested in astronomy. Christchurch is undergoing some major clean up work in the light of recent earthquake, but the countryside around is as beautiful as ever. Travel to nearby Akaroa, which is home to The Giant's House. This structure is one of the most unique bed and breakfast venues on Earth. Its quirky decorations and enormous size make it look like something from a mythical tale. It is rare for a glacier to end in a lake - but the Tasman Glacier does just that. This giant iceberg range can be found about four hours from Christchurch, and it's well worth the trek. You'll need mountaineering boots and layers - when the sun comes up, you might have ice under your feet, but it does get hot. Travelling around NZ is a joy - there's always something to lool at. Ferries are used and the fares vary depending on the season. New Zealand's bus system is efficient, clean, affordable and reliable. There are also plenty of popular rental car companies. Train travel provides a scenic and relaxing way to get from one major city to another. The ultimate way to travel is by motorhome - you get somewhere to stay and you are free to go where you want! 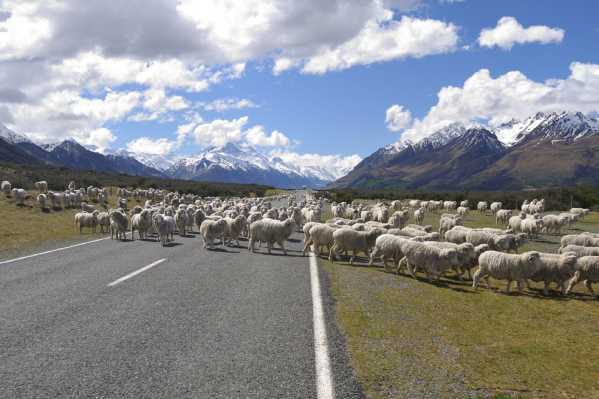 A quick Internet search for campervan hire NZ or motorhome hire New Zealand will reveal plenty of options. There are a wide variety of hotels in New Zealand. Several major worldwide chain hotels are found in larger cities. There are also many bed and breakfast accommodations scattered throughout the country. They may not offer as many luxuries as a five-star hotel, they provide a better value and a richer holiday experience.